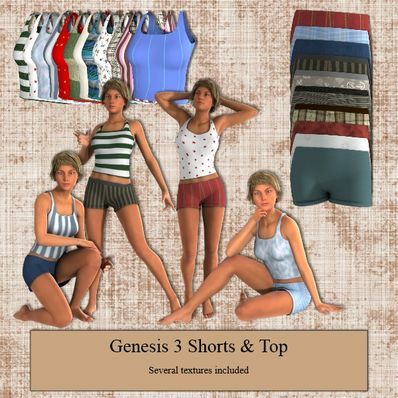 Shorts & Top for Genesis 3 Female for use in Daz Studio 4.6. Lovely, expecially the various textures! I'm new to all of this, so your items are helping a ton! Thank you! Like many others, I'm learning. Seriously, Thank You! Thank you so very much! Your generosity is very much appreciated. Although I cannot donate at this time, I will credit you in all renders when I use your items! I already commented on July 18, but I used this outfit yesterday and it's really great. Fit is amazing! Thanks so much again. Thank you so much, your generosity and your creations always leaves me in awe! Just what G3F needs for this Summer. Thanks for creating & sharing. I am happy to have those nice clothes for the new G3. Thank you very much! Thank you for everything. These are really cute outfits and will come in very handy. Thanks, again! File has been updated. Sorry about this. Thank you- another great looking outfit. You are a star. Thank you!! Much needed! Can't wait to see what you do with Genesis 3. You're awesome! Thank You for your sharing all your wonderful work!!! Wow!! You already have outfits for Genesis 3!! Impressive!! DAZ just released Genesis 3 Female a couple of days ago. Perfect outfit for summer and the extra textures are soooooo nice. Thank you so much!! That was quick ;) Thanks! Thank you so much, I'm impressed by how quickly you got this done. Thanks, these look absolutely super!